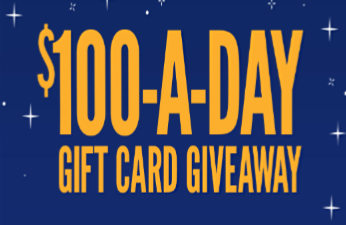 Half Price Books $100-A-Day Gift Card Giveaway Sweepstakes – Win a $100 Half Price Books gift card! Win a $100 Half Price Books gift card (14 winners)! ENTER SWEEPSTAKES HERE – Half Price Books Sweepstakes page. ENTRY LIMIT – Limit one (1) entry per person, per day. ELIGIBILITY – The Half Price Books $100-A-Day Gift Card Giveaway Sweepstakes (the “Sweepstakes”) is open only to legal residents of the United States who are 18 years of age or older at the time of entry. SWEEPSTAKES ENTRY PERIOD – Online entries must be received between Saturday, December 1, 2018 at 12:00:01 AM CST and the last day of the sweepstakes, Friday, December 14, 2018 at 11:59:59 PM CST. PRIZES – One (1) winner per day for a total of fourteen (14) winners will receive a Half Price Books Gift Card worth $100, valid at all Half Price Books stores, Half Price Books Outlets and online at HPB.com. WINNER’S LIST – The name of the prize winners may be obtained by sending a self-addressed, stamped envelope postmarked by December 24, 2018 to: Half Price Books Corporate Office, 5803 E. Northwest Hwy. Dallas TX 75231, Attention: Half Price Books $100-A-Day Gift Card Giveaway.